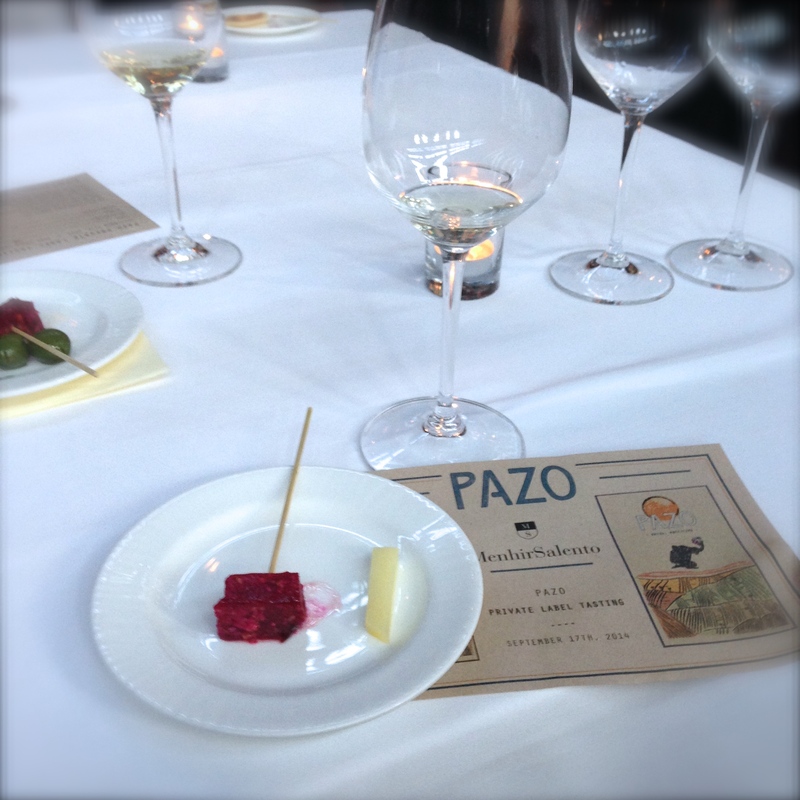 Pazo – eating my way through Charm City! I was somehow invited to a complementary wine tasting at Pazo. They were offering their two house wines – one red and one white – along with some light appetizers. The appetizers went very quickly – as some folks just hovered by the food table and filling their plates as soon as platters were dropped off. Never the less, we were able to taste some of their apps. They had a great charcuterie selection with copa, lamb prosciutto, and manchego cheese served with fresh bread. We also tried some of their arancini, which are fried risotto balls that were stuffed with veal. They also passed the fried calamari with dipping sauce. Both apps were good, not my favorite – I think the ones at Birroteca are better. My favorite of their free offerings was the one thing that seemed to get looked over. It was a chilled bite of beets – pictured above. I would love to know how they managed to give it that gelatinous quality while combining strong earthy beet flavor and a few nuts for texture. We didn’t eat a whole bunch – so we moved down the bar – for another glass of their house red and a few more small plates. Although, we had a very hard time deciding we eventually went with sausage pizza. They are small, with a very thin thin crust, but the ingredients are fresh and the combinations are thoughtful. 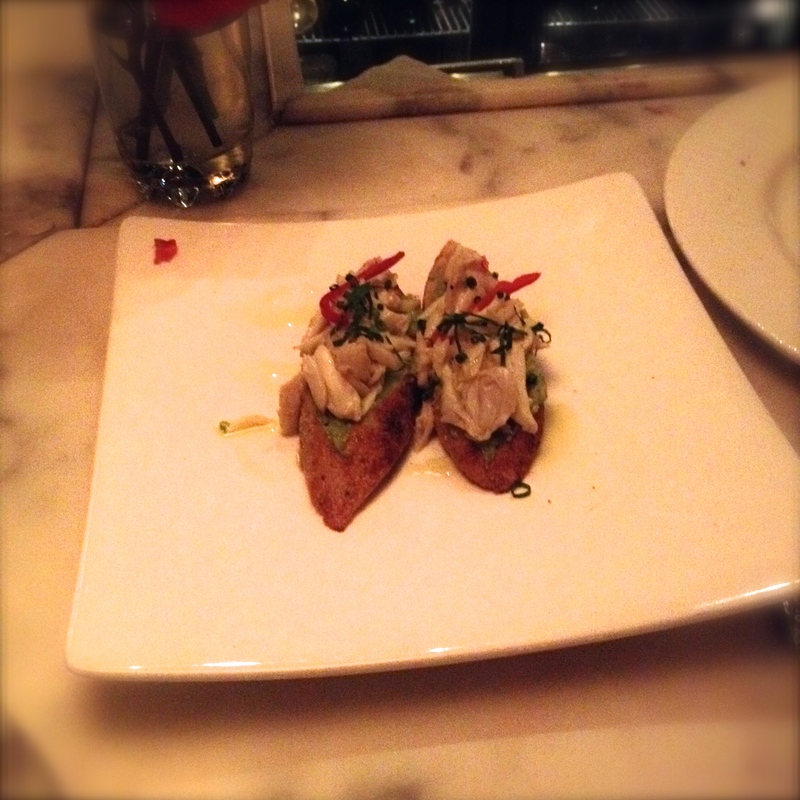 The winner of the night for me was the crab and avocado brushcetta. The baguette was toasted and dusted with olive oil and then topped with a mix of the crab and avocado. I can’t be sure of the other herbs and ingredients as they did not stand out. The fresno chili’s gave it a little heat, but the sweet local crab was definitely the star. Still felt a little pricey for these bites. This entry was posted in All Good., Charm City, Fells Point, Happy Hour, Harbor East. Bookmark the permalink.